(Newser) – Barack and Michelle Obama have book deals. 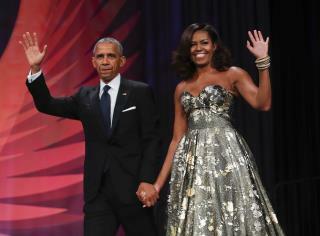 The former president and first lady have signed with Penguin Random House, the publisher announced Tuesday. Financial terms were not disclosed for the books, which several publishers had competed for, although the deals are likely in the tens of millions of dollars, the AP reports. (Sources tell Politico the auction for rights to the books went higher than $60 million.) Both Obamas have published through Crown, a Penguin Random House imprint. But Penguin Random House declined comment on which imprint or imprints the books would be released through. "We are absolutely thrilled to continue our publishing partnership with President and Mrs. Obama," Penguin Random House CEO Markus Dohle said in a statement. "With their words and their leadership, they changed the world." Perhaps Obama could entitle his "How I Ran Up More Debt Than All Other Presidents Combined"? His wife could entitle her book "How I Hated America Until the Taxpayers Picked up My Tab". This is how payment for play gets legitimized by those in power.